Spain is now the world's largest generator of electricity from solar power plants. 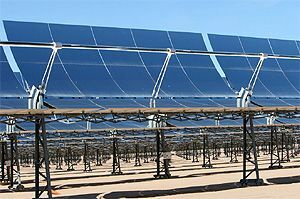 Spanish solar energy plants utilise parabolic trough technology combined with a thermal storage system using molten salt batteries to maximise their power generating capacity. The parabolic trough is constructed as a long parabolic mirror with a Dewar tube running its length at the focal point. Sunlight is reflected by the mirror and concentrated on the tube, where it is absorbed by the heat transfer oil flowing through it. Rotork IQ intelligent electric actuators with Rotork Pakscan two-wire digital control systems are in widespread use throughout these plants. 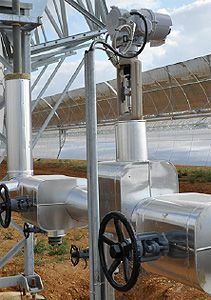 Rotork has worked closely with the solar energy industry to integrate an economical and efficient IQ actuation and control system into the plant design. The decision to use Rotork's Pakscan P3 control system was assisted by its extremely long range bus capabilities and cost savings. Each Pakscan P3 master station can operate a bus loop of up to 20 kilometres in length with no deterioration in communication performance or the need for repeaters, making it ideal for the spacious environment of a solar power plant. Repeaters require separate power supplies, can slow the data transmission speed and introduce a single point of failure. The failure of a repeater will result in the loss of communication with all downstream field units. 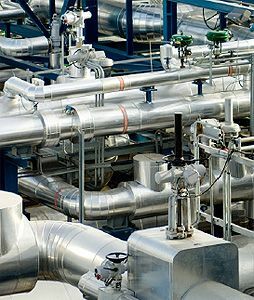 Rotork valve actuators are installed on the HTF (heat transfer fluid) pipelines carrying oil around the mirrors, the salt storage pipework and the power plant pipework. The majority of actuators are IQ multi-turn and IQT quarter-turn models, with IQM modulating actuators utilised for control valve duties, generally operating from a 4-20mA control signal. The ability to commission IQ actuators without removing electrical covers in order to set end of travel switches and torque settings makes the commissioning process highly efficient, providing significant time and cost savings in comparison with conventional actuator commissioning. Rotork's ‘non-intrusive' data technology provides bi-directional communication between the actuator and the hand held setting tool. The tool enables actuator configuration data to be retrieved and retransmitted to other actuators, with the potential to save immense amounts of time when many valves require near identical commissioning settings. Up to ten configuration files and four data logger files can be downloaded and stored in the IQ setting tool. Commissioning can be performed with or without mains power and ensures that internal electronic components are permanently protected from the possibility of contamination by moisture or dust, securing long-term reliability in environmentally challenging conditions. All IQ actuators are equipped with a data logger to record historical operating data and valve torque profiles. This data can be downloaded from the actuator and analysed on a PC running Rotork IQ-Insight software to quickly evaluate operational issues and valve performance. Effective asset management programmes can be implemented and unexpected plant interruptions eliminated. Additional features and functions of the lightweight but rugged IQ actuator design enhance the long term efficiency of the plant operation. In particular, the large actuator LCD window clearly displays real time valve position together with active valve, control, status and alarm test messages with multilingual text capability. The onboard data logger records this data in addition to historical valve torque profiles, providing valuable additional information on valve and plant operating conditions. Accurate, repeatable torque measurement is achieved independently of variations in frequency, voltage and temperature. Meanwhile, patented IQ non-contacting position measurement - using only one moving part - converts output rotation into an electronic signal which is compared to position limits stored within a safe, non-volatile memory. Unlike some other designs, it cannot slip. When the actuator is ordered to reverse direction an automatic time delay circuit avoids the shock loads which may cause excessive wear to valve stems and gearboxes. 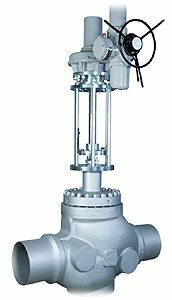 To ensure reliable operation of infrequently operated valves, a lost motion hammer blow effect is incorporated to unseat a tight valve. In addition, the torque switches can be by-passed during the first 5% of travel away from the valve seated position. If this additional torque is still insufficient to cause movement the IQ recognises the valve is jammed and stops operation to prevent motor but out or further damage. Finally, the handwheel provides reliable emergency manual operation that is mechanically independent of the motor drive. It includes a padlockable hand/auto clutch for safe operation even when the motor is running. The manual override can be engaged while the motor is running without damaging the actuator internal parts. Actuators are controlled and monitored by Rotork Pakscan P3 master station supervised loops. Thanks to the web server installed in the P3 master station, the operator in the main control room has a clear picture of the condition of all the actuators on a loop at all times, even in the event of a failure of the main plant control system. Pakscan provides dual host communication paths as standard with the ability to isolate any field based fault without interrupting communication with other units on the loop. The configuration provides built-in redundancy in every area - from the valve to the control room - ensuring that vital information on valve position, status and condition is as secure and available as possible. Modbus TCP protocol facilitates Ethernet communication, whilst the Pakscan web browser provides access to all data from the master station and the field control units at near-instantaneous speeds using standard web pages. This data includes field diagnostics, enabling the maintenance team to identify any fault at the office desk rather than in the field, whilst automatic email generation for alarm conditions can also be configured to give the maintenance department immediate warning of master station problems. In addition to new solar energy plant projects, Rotork has also been involved in the upgrading and automation of plants that are in operation. For example, for two sites requiring automation of valves on the heat transfer fluid pipework, Rotork provided a specially developed linear-acting variant of the IQTF multi-turn actuator to meet very high mechanical output resolution in response to minimal signal changes from the controller. The stroke of each valve is 30mm and the requirement is to move a minimum of only 1% of this stroke, resulting in discrete movements of only 0.3mm. To meet this requirement, the linear version of the Rotork IQTF operates at a relatively low output speed to provide maximum resolution and accuracy. The positional monitoring and control signal is provided by the Pakscan P3 system. At each site Rotork has installed 168 actuators and four Pakscan P3 master stations for the automation of the 3 inch globe valves, to introduce remote control of the HTF temperature. The retrofit project was performed by Rotork Site Services, a dedicated organisation within the Rotork Group that supports all the actuator operations with a range of activities including retrofitting, maintenance, repair, extended scope projects and life of plant programmes.